Inspired by vintage Cuban cigars that Nat Sherman himself originally hand crafted in Cuba, Nat Sherman, Inc., has introduced the only long-filled, handmade Dominican cigar that is exquisitely joined to an elegant, amber-tone cigar holder. The care that went into seamlessly joining the tip to the body assures an easy draw and the finished presence of a much bigger and yet cooler smoke, according to the company. A special blend of Dominican and Havana seed tobaccos, along with a Connecticut shade wrapper, combine to create a medium-bodied cigar with a "balanced palate satisfying the most discriminating smoker." These tipped cigars are available in a single size, measuring 7 x 38, and are packaged 30 to a box. Nat Sherman, Inc., 629 West 54th St., New York, NY 10019, Tel: (212) 246-5500, Fax: (212) 246-8639. S.A.G. 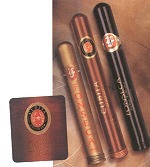 Imports is offering a convenient pocket-size humidor with its Fonseca and Cubita brands. The new cigar tubes come with an individual cigar wrapped in cedar and sealed with a cork cap. The tubes are S.A.G. 's way of maintaining their products' freshness and full flavor. The company is also introducing high-quality miniature cigars. The new minis use all long filler, all-natural tobaccos from the Dominican Republic. They are available in either the Fonseca brand as 41/8 x 30 "Minis" or Cubita brand as 33/4 x 26 "Mini Delicias." Both are packaged in compact tins. S.A.G Imports. Inc., 4721 SW 75th Ave., Miami, FL; Tel: (800) 272-5396; Fax: (305) 267-7883, Web: www.matasa.com. The Queen of the Caribbean Cigar Company has released the Impacto line of Gran Cru cigars. The cigars consist of Jamastran Honduran filler and binder with Honduran-grown, Cameroon-seed wrapper. According to John Crane, president of Queen of the Caribbean Cigar Co., "the tobaccos are aged an extra-long three years to attain a blend that is smooth and balanced, with medium-to-full body." The cigars are produced by Julio Eiroas, who has been growing tobacco and making cigars in the Honduran Jamastran Valley for more than forty years. The Impacto is available in six classic shapes: Torpedo, Double Corona, Churchill, Corona, Robusto, and Panatela. Suggested retail prices range from $4.25 to $6.70. Queen of the Caribbean Cigars, 30600 Northwestern Hwy., Ste. 300, Farmington Hills, MI 48334; Tel: (248) 737-9300; Fax: (248) 737-9301. The Oliveros Gold Series, enhanced with Kelt Cognac, was finally set to ship at press time. A beautiful new wood box, carefully constructed to protect 10 of these exquisite cigars in their glass tubes, is finished with a gold stamped Oliveros Crest. In addition, the Oliveros Classic Collection, which features fine aged Cuban seed long filler and Dominican Olor binder and Indonesian wrapper, has been re-blended from a mild to medium-bodied cigar to a medium to full-bodied cigar. Retailers can now match an Oliveros cigar to any consumer preference: Gran Reserva Connecticut wrappers for mild to medium bodied tastes; Gran Reserva Cameroon and Maduro and Classic Collection for medium to full bodied tastes; and the Club Collection for those consumers that enjoy an outstanding premium cigar with the natural flavor of honey, molasses, peach, orange, vanilla, cinnamon, or chocolate. Habanos Distributors, 717 Ponce de Leon Blvd. Ste. 230, Coral Gables, FL 33134, Tel: (800) 954-8522.